At Associates in Hearing HealthCare, we provide a full range of services to diagnose, treat and prevent hearing loss. Hearing tests are used to determine if a hearing loss is present, the cause, and the best means to correct the problem. We also recognize your hearing loss is making communication difficult. Know that help is available. Hearing aid studies have shown that people who have a positive attitude do better with hearing aids. Our most asked question is always “What can I expect during my first appointment?” Given that hearing problems effect the entire family and social circle, it is strongly recommended that the new patient have a spouse, family member, or friend attend the consultation as their input can be very helpful. Here’s a quick explanation of each step of the initial appointment, from front desk check in to (if necessary) purchasing your first set of hearing aids. When you make an appointment, intake paperwork will be emailed to you to complete prior to your arrival. If you are not able to complete the paperwork via email, upon arrival you will be asked to complete a form that includes your personal information, insurance information, and health history questionnaire. Your significant other will also be asked to complete a brief questionnaire. We are also required to obtain HIPAA and release signatures. Please bring a photo I.D. Our office staff will contact your insurance provider to determine if you have coverage for hearing aids. If you are working or seeking employment, you may be eligible for hearing aids through the State of New Jersey. At the time of the hearing evaluation, a medical and hearing history will be taken to determine the type of hearing problem that the individual perceives and how his/her family perceives the hearing problem. Questions will also be asked about the onset of the hearing loss, presence of tinnitus (ringing in the ears) and dizziness. If testing reveals a sensorineural hearing loss, hearing aids are usually the treatment of choice. To ensure our providers can determine how to best help you, identify communication settings that are difficult for you. Relate those settings to your audiologist. If your audiologist understands your communication needs, they can better address your problems in choosing the best hearing aid for you, programming the hearing aid and helping you to develop strategies to manage your difficult situations. The Audiologist will use an otoscope to inspect your outer ear and your ear canal for any abnormalities that may affect your hearing test results or require you to visit an ENT doctor. 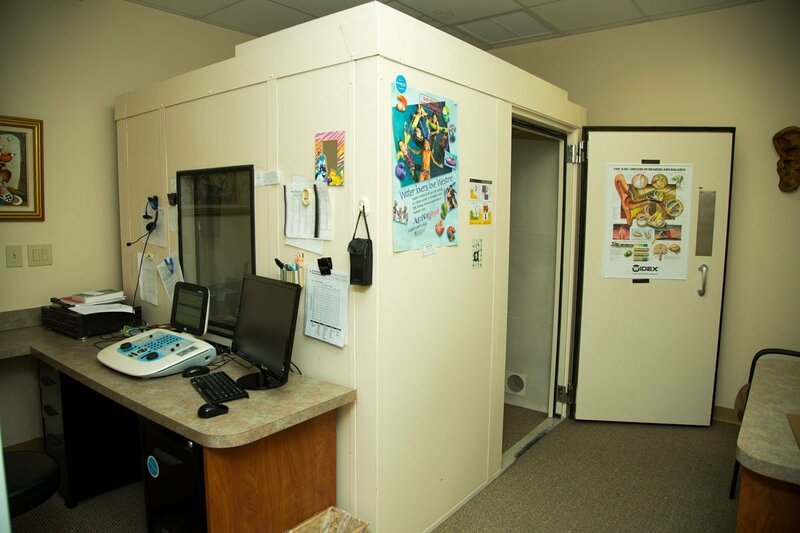 You will be seated in a sound attenuating booth for the hearing test. We will present tones to your ears and ask you to indicate whether or not you can hear them. Our goal is to find the softest sound that you can hear at each pitch. This is done in two ways: air conduction and bone conduction. The air conduction pathway is the traditional route for sound waves to travel in the ear, through the outer, middle and inner ear and ultimately to the brain. The second pathway for sound to be heard is through bone conduction. When an oscillator is placed on the mastoid bone behind the ear and a tone is presented, that tone can be heard through vibrations in the skull. By comparing the softest sounds you can hear by air conduction and by bone conduction, we can determine the type of hearing loss present. You will hear some words and be asked to repeat them. If you are not sure of the word, we then encourage you to take a guess. How well you are able to repeat the words you hear can be combined with the other test results to determine which type of hearing loss is present. This test is performed to measure how well your eardrum is moving. Your eardrum moves back and forth in response to sound waves. Fluid in the middle ear space, earwax accumulation, or a hole in the eardrum may affect how well it moves. A healthy inner ear creates a sound in response to acoustic stimuli. These are called otoacoustic emissions and the presence or absence can be used to determine the type of hearing loss you have. If you hear noises or ringing in the ear, you may be tested to determine the type and severity of the head noises. You will be asked to match a sound to the one in your ears, both in terms of loudness and sound quality. Background noise is a significant challenge to many people with hearing loss. You may be asked to repeat sentences in the presence of background babble, similar to a cocktail party. The babble noise gradually gets louder until you are no longer able to detect the primary talker. This is helpful in assessing your performance compared to listeners with normal hearing. 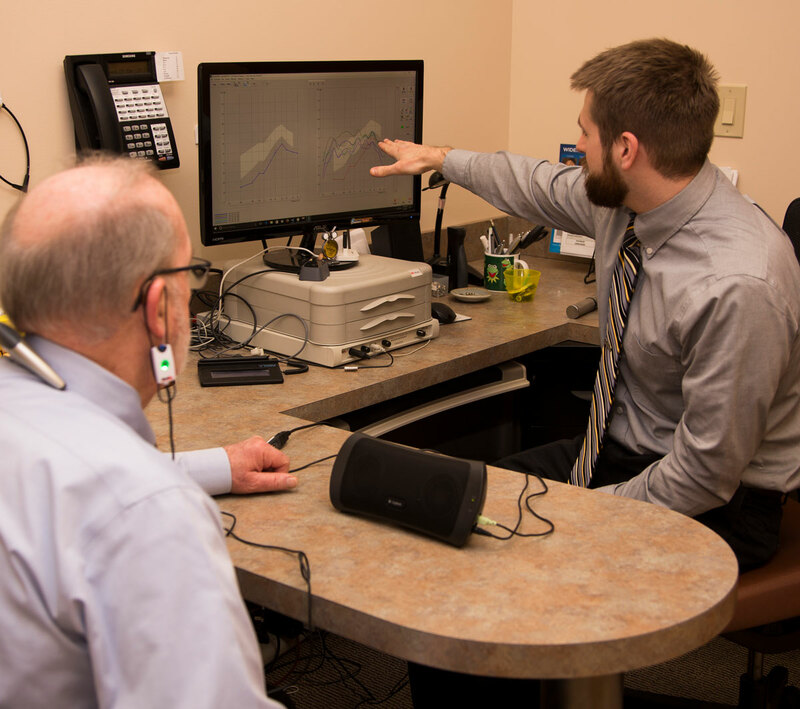 In certain scenarios, based on the results of the hearing test and the answers to these questions, our highly trained audiologists and hearing instrument specialists may make a referral to a medical doctor for an examination and possible treatment. We also provide tinnitus diagnosis, evaluation and rehabilitation. If you do indeed have a hearing loss and you are a hearing aid candidate, our audiology experts guide you through the vast selection of hearing aids and determine which will best fit your needs. We carry a full line of hearing aids featuring the latest digital technology, including Bluetooth and smartphone app connectivity. After you choose the make, model, and color of your hearing aid, we’ll give you an information packet outlining pricing, included services with purchase, and reasonable expectations of hearing aids. The final decision on which hearing aid is purchased is the choice of the wearer. During the hearing aid fitting, the device is programmed to meet the unique needs of the wearer. The new wearer is provided with instructions for inserting and removing the hearing aid, changing the batteries, and the proper care and cleaning of the device. This is also the time the provider reiterates the function of the hearing aid as it relates to the individual’s life style. After you review and sign your contract, we’ll schedule a follow up appointment to check on your progress. 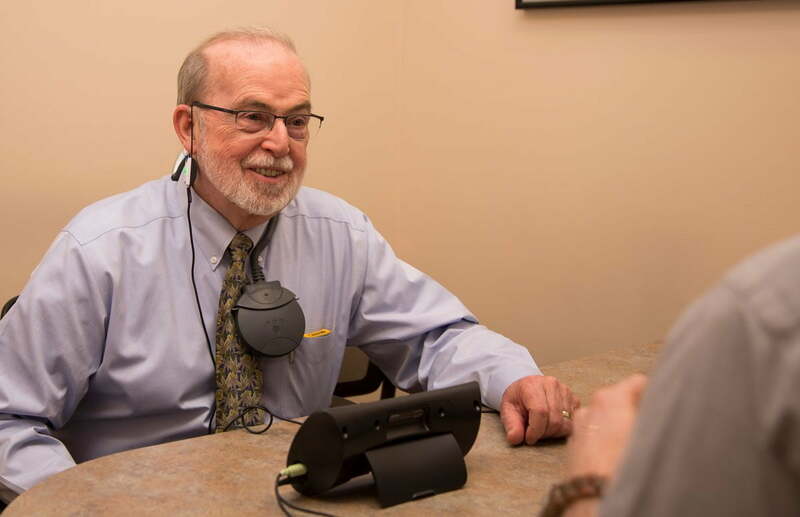 At your first follow-up appointment, we’ll provide a COSI questionnaire and/or perform Live Speech Mapping to verify and validate the benefits of your new hearing aids. It’s also best to have routine maintenance and cleaning scheduled to preserve and protect the function of your hearing aid. You can usually schedule appointments for adjustments and routine checks within one week. With your purchase, Associates in Hearing HealthCare provides a free supply of batteries for the lifetime of the aids (some exclusions may apply).